When a Bathwick resident e-mailed me to let me know that in his garden was a brick-built air raid shelter, I arranged to take my camera along and photograph it. It was in surprisingly good condition after all this time. The garden sloped down from the house, and the shelter entrance, facing away from the house, was level with the lawn. The back of the shelter was thus dug into the slope of the garden with the roof slightly below the ground level at that part of the garden, allowing soil and plants to be placed on top of the roof to camouflage it. Today, climbing plants grow up the front of the shelter, concealing it, but it is not known whether that was the case when the shelter was built. The entrance (picture left) was revealed by cutting away the foliage covering it. In the picture you can see that the front of the shelter is made of brick. The left wall is the left hand side of the shelter. The passage is about 3 feet (90cm) wide and 6ft 6in (1.9m) high. The ceiling is of reinforced concrete, and the two dark scars in the ceiling is where the concrete has chipped away revealing the steel reinforcement inside. The back wall is also reinforced concrete. The floor is concrete without reinforcement. 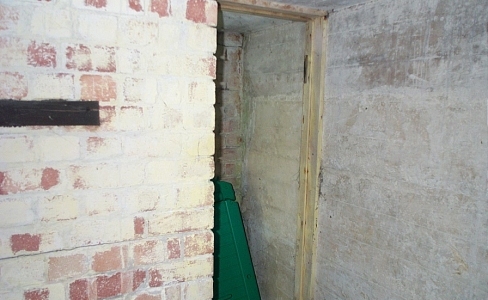 The right hand side of the passage is a brick wall, and there is a doorway on the right at the far end of the passage, but you can't see it in this picture. You can see this doorway in the picture on the right, taken from inside the shelter. The door is no longer in place, but the dark mark on the right hand door frame is where a hinge was fixed. The timber door frame is in surprisingly good condition considering its age. Clearly the shelter was, and still is, weatherproof enough to stop the timber rotting. In this picture you can see the end wall opposite the doorway (which is the right hand side if you are in the garden looking at the front of the shelter). I did not measure it exactly, but by counting the bricks, the inside distance, front to back, of the shelter would be just under 9 feet (3 metres). The concrete wall on the left hand side is vertical, not sloping, but unfortunately the wide angle lens I used to get the whole of the end wall in one picture distorts the perspective of things close to the camera. 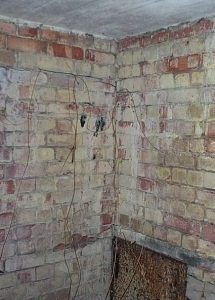 The next photograph shows the ceiling from the inside (the right hand side of the photograph is the back wall of the shelter). The ceiling (which is also the roof) is made of a series of reinforced concrete blocks, long enough to span the distance between the two side walls (I didn't measure this but I estimate that it is about 16 feet (4.3m). The ceiling blocks are about 9 inches (23cm) wide and they are cemented together to make a waterproof structure. Even today, it keeps the inside dry. The last two pictures show (on the left) the corner opposite the doorway. You can see that the front wall is of brick, and that at the bottom of this front wall is a steel plate, which you can see more clearly in the picture on the right. This plate, held in place by four screws that are now badly rusted, covers an exit hole about 3 feet (90cm) square. 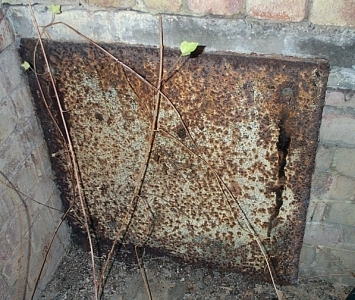 There was a similar steel plate on the outside of the shelter, but having been exposed to the rain for over 60 years, the outside plate is now almost completely rusted away. The purpose of the plate was to provide an emergency escape hatch. If a bomb landed close enough to the shelter to damage or block the usual entrance passageway, anybody inside the shelter might have been trapped inside. After undoing the screws, this plate and the one on the outside could be removed, allowing the occupants of the shelter to get out. This type of shelter is not the type that the average Bath resident would have used. Most households that erected an outdoor shelter would have chosen an Anderson Shelter. This brick and concrete construction would have been expensive, and it must have been built in the early days of the war, before shortages of materials started to affect the building trade. It is a tribute to its builders that it has lasted so long, and it appears to be still weatherproof. Certainly on the day I took these photographs, there were no signs of damp inside. I have looked at the bomb locations, and it seems that after all the trouble and expense of building this shelter, no bombs fell close enough to this street to threaten the lives of the residents. I imagine the shelter was used, since it was dry and spacious and offered excellent protection, but even without it, the residents of this house would have survived the war.